Tens (if not hundreds) of daily fantasy sports (DFS) sites have been popping up in the past years. 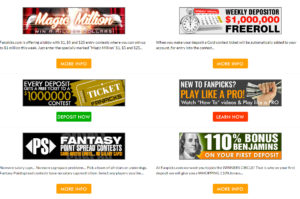 FanPicks themselves have been around since the 2015 NFL season, picking up casual and ardent fans of sports that are looking to make a bit of cash on the side. Those who are looking for a new world-class competitor in the DFS market have the opportunity to use our FanPicks promo code on their website for some extra goodies to boot. We’re saying world-class because FanPicks isn’t just another DFS site looking to make a quick payout. You would be playing against the likes of Hulk Hogan (who became a spokesman for them in September 2015), Roddy White, Thurman Thomas, and others. But celebrity endorsements will not be the subject of this FanPicks review. These are the aspects that interest most users; so let’s not waste any more time and dive right into it. You can use your FanPicks promo code to win money in all the American favorites. 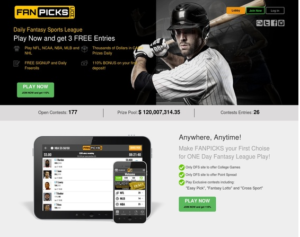 Whether you’re an NFL, NCAA, NBA, MLB, or NHL fan – FanPicks has the game for you. The players’ salaries are capped at $50,000 regardless of what you’re playing. No need to overcomplicate things for the users, right? If you’re not satisfied with these options, players have the opportunity to create their own custom contests and play as such. It’s your money, and your FanPicks promo code, so you might as well spend it how you like! CLICK HERE TO SIGN UP WITH FANPICKS! Through PayPal, MasterCard, Visa, American Express, and Discover you can make minimum deposits of $10 for your plays. Pretty basic in terms of deposit options, but do you really need more than that? In any case, the minimum withdrawal stands at $50. You can choose to be paid through check and PayPal, which may seem limiting to some. At least they process the payments in a maximum of two days. If you encounter any issues, you can contact FanPicks through their live chat and contact forms. We couldn’t find a phone number on their website. Whether they don’t provide customer support through a phone line or they didn’t pick the best place to put the phone number remains a mystery. The contact form has a spot for a number, so they probably work on a “don’t call us, we’ll call you” model. For some, that may be a red flag – at least the live chat and email support is A-OK. The site is pretty straightforward, and they have a nifty mobile/tablet app you can check out. This FanPicks review will concentrate on the desktop/ browser version. You have your game formats at the top, and the sports on the right. You can search for particular matches using an advanced filter (entry fee price, number of players, etc.). Or, just select contest types for particular sports. All joking aside, there’s one minuscule complaint about how the filters work, though. To a newcomer, it might not seem very intuitive. For example, clicking/tapping on multiple filters (e.g. NBA and MLB Salary Cap games in a Top Three format) – you have to figure out that the orange color on the “format” filter means it’s active. You would think an active filter would be green-colored. Ultimately, you can just use the search function to find what you’re looking for (especially if you’ve been to other DFSs and know your stuff). In any case, after a few minutes of getting used to the interface you can start having some fun. Use your FanPicks promo code, create a custom game, and start taking other peoples’ money from under their noses! Everybody loves them, but the FanPicks bonus selection can feel a bit lacking. On the other hand, what they don’t have in special offers they make up with million-dollar prizes. Now there’s something you can put your FanPicks bonus code towards. We’ll get to them in a second after discussing some other aspects. First up, we have the funnily named 110% Bonus Benjamin’s. If you haven’t guessed yet, you get 110% of your first deposit. Say you deposit $100; you get to play with $210 instead! This FanPicks bonus goes up to $1000, so don’t get any rash ideas. Second of all, they hold several freerolls every week with cash prizes up to $100. As for the million dollars we talked earlier – you have a chance to win one in the Magic Million Contest. Turn that FanPicks promo code and measly $5 deposit into a million with a stroke of extra luck! Payouts are sent out in a maximum of two days after the contest is finished. Though, that million dollar prize will be delivered to you in increments of $10000 a day. Nobody can complain about that – after all, you’re a millionaire now. All other payment deliveries can be found on their website. Claim Your FanPicks Promo Code Today!